Text: Thursday, 6 March – German film last night at Polytechnic Cinema. One has the idea that all films are crowded. The balcony here was not 15% full. Front row, where Duff Tayler and I were, 8s. 6d. for 1½ hours’ entertainment. A gloomy place, with gloomy audience. No style or grace in them. All lower middle class or nearly so. The hall tricked out with a silly sort of an ikon, illuminated, of Death, to advertise or recall or illustrate the film. The orchestra most mediocre. Played all the time, and three performances a day! Hell for the players I should think. Also the habit of illustrating certain points musically, or noisily. The clock must strike, etc. And a special noise as a sort of leit motif for death. Lastly three small common Oriental mats (probably made in England) laid in front of the screen on the stage to indicate that much of the story was Oriental. The captions, etc, were appalling, and even misspelt, such as ‘extention’, ‘Soloman’ etc. The phrasing! Good God. The City of Yesteryear meant, I believe, the cemetery. Comments: Arnold Bennett (1867-1931) was a British writer, best known for his novels of life in the Potteries with its ‘five towns’ that now equate with Stoke-on-Trent. 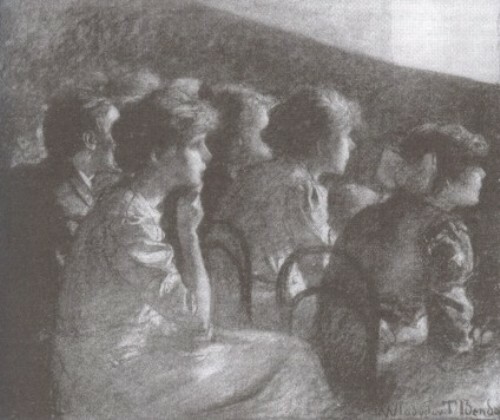 The Polytechnic Cinema was part of what was originally the Royal Polytechnic Institution, a venue for popular science lectures and entertainments, which hosted the UK debut of the Lumière Cinématographe in February 1896. It operated as a cinema in the 1920s, and was recently re-furbished and relaunched as the Regent Street Cinema. The film Bennett saw was Fritz Lang’s Der müde Tod aka Destiny (Germany 1921), which features Death as a character and a sequence set in Persia. This entry was posted in 1920s, Diaries, United Kingdom and tagged Arnold Bennett, Audiences, Der müde Tod (1921), German films, Intertitles, London, Music, Musicians, Prices. Bookmark the permalink.